Jesscia at the end of the Heaphy Track in New Zealand. Once you take your kids hiking they keep coming back. In 2002, Jim DuFresne, the Lonely Planet author of Hiking & Tramping in New Zealand, was researching a new edition of the guidebook when his daughter, Jessica, flew to New Zealand to join him on some of the country’s classic tracks. KAHURANGI NATIONAL PARK, New Zealand – We hoisted our backpacks in a drizzling mist at the start of the Heaphy Track so it was early afternoon when this country began to tantalize my daughter downunder. After climbing to the highest point of the day, a rocky knob known as Flanagan’s Corner, the rain suddenly stopped, the clouds parted and there, looming over us, was Mount Perry. An even more gratifying sight was just 30 minutes down the trail; in the tussock grass of an alpine saddle was a hut with a wisp of smoke drifting out of its chimney. Mountain peaks surrounding a mountain hut. In the middle of the Tasman Range – a five-hour hike from the nearest road – we were able to dry our wet gear next to a wood stove, grab a bunk for the night and enjoy the company of a dozen other backpackers from four different countries. “Sure beats sleeping in a tent,” I said while sipping a mug of hot tea and Jessica readily agreed. Before this South Pacific country became Middle Earth in the Lord of the Rings film or even the home of the America’s Cup, it had long been a haven for those of us who loved to trek above the treeline. New Zealand’s rugged landscape, temperate climate and good rainfall has lead to a nation where hiking in the alpine and tramping in the bush are as much a part of its heritage as sailing, cricket and serving scones with afternoon tea. This explains why New Zealand has so jealously preserved a third of its landscape as parks or wilderness areas, one of the highest percentages of any country in the world. Or why a place smaller than Colorado is home to 14 national parks, including the largest one in the southern hemisphere; an extensive track-and-hut system; and the Milford Track, known as `the finest walk in the world’. “Tramping is just a way of life here,” said Ray Waters, a Kiwi guide we spent four days with on the Queen Charlotte Track. 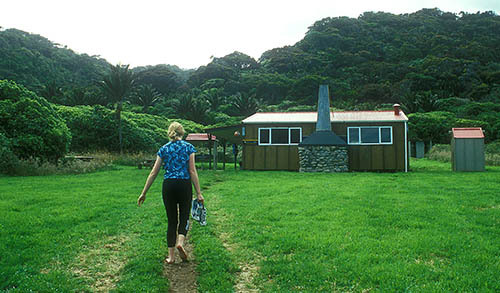 Trampers accommodations; the Heaphy Hut that overlooks the Tasman Sea. 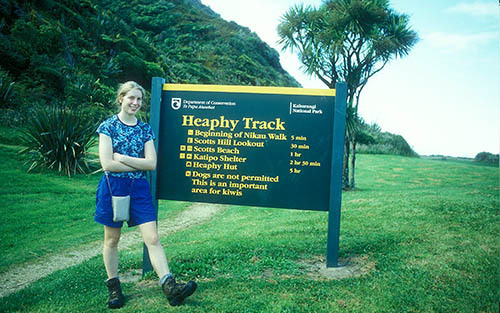 I had been in New Zealand almost a month when Jessica arrived and I whisked her away to her first tramp; the Heaphy Track. This low alpine crossing is a five-day, 50-mile walk in the northwest corner of New Zealand’s South Island, a historic trail that winds through the rugged heart of Kahurangi National Park and ends at the Tasman Sea. It’s an easy walk and a gentle climb. The first two days were along an old packhorse track that prospectors carved out of the bluffs in the late 1800s as a route to the goldfields on the West Coast. Our longest day was 13 miles. There was a swingbridge suspended over most streams and every night was spent in a hut that allowed us to lighten our load by leaving the stove, sleeping pads and tent at home. It was the Heaphy Track that galvanized the New Zealand environmental movement in the early 1970s when developers proposed using the route to build a road to the West Coast. A country of trampers united to save it and today it’s something of a pilgrimage for every Kiwi who owns a pair hiking boots and a rucksack. The diversity of its scenery is amazing. The track begins in beech forests on the east side, crosses rolling red tussock downs above the treeline in the middle and then descends to a tropical setting along the Tasman Sea. The final day when we headed south and skirted the pounding Tasman Sea, is one of the best walks anywhere in New Zealand. Sometimes we were hiking through groves of nikau palms and giant tree ferns, sometimes we were on the edge of a bluff watching the sea crash along the shore. And often we decided to bypass the track and opted instead to follow a long stretch of wilderness beach. The next morning we chartered a small plane, flew across the South Island and joined Waters on the Queen Charlotte Track. By design, Jessica’s second tramp was totally different from her first. The Queen Charlotte is located in the Marlborough Sounds, a convoluted labyrinth of bays, coves and islands at the northern tip of the South Island. The track is a four-day, 41-mile walk that can only be reached by water taxi from the town of Picton. There are no mountains or alpine crossings along the Queen Charlotte. Instead, each day was spent hiking the crest of a skyline ridge, enjoying stunning views of bays, inlets and Ship Cove where Captain James Cook landed in 1770 and spent 23 days re-outfitting his ship. There are no huts. At the end of each day, we descended the ridge to a quaint seaside hotel with a small restaurant and a pub where we could relax on a veranda to a view of the water. It’s debatable what was more enjoyable after a long day of tramping; the hot shower or a cold beer. And we didn’t have to carry a backpack. The water taxis that dropped us off at the start of the track also forwarded our equipment to the next hotel. On our final night, while I was enjoying a plate of green-lipped mussels that had been steamed in white wine and garlic, Jessica announced that the Queen Charlotte was her favorite walk. “This is how I like to backpack,” she said. It’s amazing how she’s getting more like her mother every day. 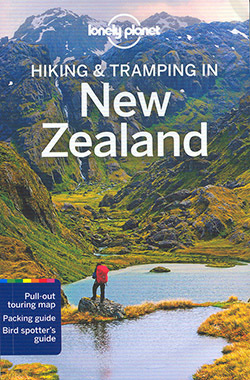 Jim DuFresne is the author of Hiking & Tramping in New Zealand from Lonely Planet. The guidebook is an excellent first step to planning a backpacking adventure to the country and can be ordered from the MichiganTrailMaps.com e-shop.